Nathan Schneider shares his experiences and observations as a journalist during the Occupy Wall Street movement, where he spent much of his time participating in the marches, meetings, and camp-0uts in Zuccotti Park. He offers an insider’s perspective on the goings-on of the protests. 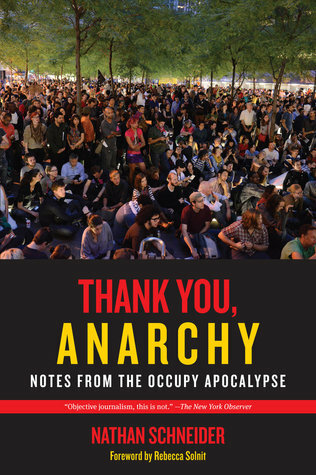 I was interested in reading Thank You, Anarchy because I was curious to read a journalistic perspective of the OWS movement without the filter of the major news corporations. Unfortunately, I was hugely disappointed with the book and Schneider’s own self-admitted bias of the event. Written with a strong slant and open adoration of the political motivations and agendas (or lack thereof) behind the movement, as well as a close-minded disdain for any opposing view point, this book seems to have no intentions of proselytizing to unbelievers in the OWS movement- but only to sing it’s praises. I would definitely call this a polarizing book- either you will like it very much or you will hate it, depending entirely on your moral/political views. I, for one, did not like it.